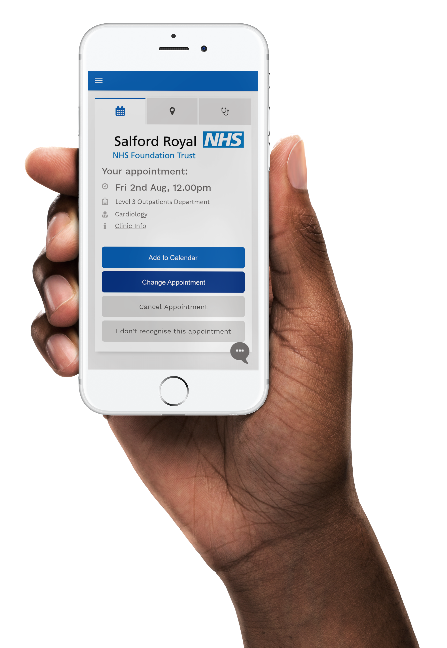 Salford Royal NHS Foundation Trust (SRFT) is launching a new online patient booking and management system. Once fully rolled out, the system is expected to be the most advanced online patient management system in the North West region. Salford partners are committed to using new and innovative technology to improve the patient experience. What do patients need to do? Make sure you have provided your up-to-date mobile number to SRFT so they can contact you. If you do not want to use the text messaging or online system, you can continue to be contacted by letter only and can telephone the call centre to rearrange your appointment. James Sumner, Chief Officer at SRFT said: “This is a very exciting new service for Salford patients. When fully rolled out, we will have an extremely advanced online patient management facility which will empower patients to control their appointments. “We continue to improve patient experience by being more flexible and giving more choice. In addition, we will be reducing the number of unattended appointments, cutting waiting times and vastly reducing the number of appointment letters we send out.